What is the function of an air conditioner? Maintaining the temperature to desired level. Humidity control inside the room (De-humidification). The air conditioner attains the desired temperature according to the temperature set by its thermostat. The compressor in the air conditioner is turned on and remains on until the room temperature decreases to be the same as the temperature of the thermostat. Once the desired temperature is reached, the compressor turns off until the room temperature increases again. This turning on and turning off, of the compressor determines a cycle of the air conditioner. This concept is discussed in detail below. What is the cycle time of air conditioner? The cycle time of an air conditioner is the amount of time the unit runs to maintain the temperature of the room equal to the temperature setting of the thermostat. If the thermostat is set a very low temperature as compared to the room temperature, the compressor has to work for a longer time to decrease the room temperature, thus, increasing the cycle time. In other words, greater the temperature difference between the room temperature and thermostat temperature, greater will be the cycle time and vice versa. What are the factors affected by cycle time? Power consumption: An air conditioner consumes a lot of power every time its compressor is turned on. This power is much greater than the power consumed by air conditioner for continuous operation (long cycles). Hence, it is not necessary that an air conditioner with short cycles consumes less power than one with long cycles. Humidity: An air conditioner’s comfort level depends on its humidity removal capability. This, capability improves as the cycle time increases. An air conditioner with frequent on off cycles cannot remove humidity from the room. Thus, long cycle time promotes humidity removal capability of an air conditioner. Usually, undersized air conditioners have much better humidity removal capability as compared to over-sized air conditioners, since the former have longer cycle times. An Air Conditioner connected so that the blower turns on and off with the compressor provides the most moisture removal. 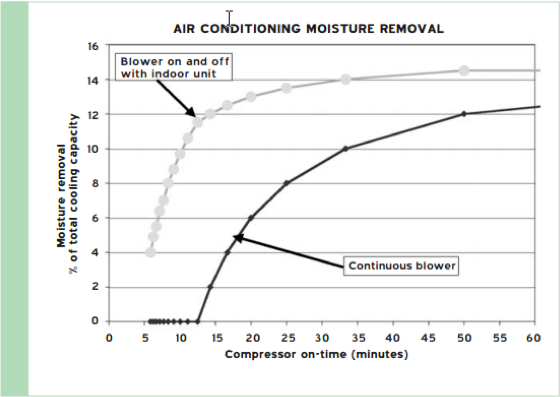 In addition, that moisture removal improves dramatically when the compressor runs longer. Continuous blower operation, on the other hand, reduces moisture removal to zero, unless the compressor runs for more than 13 mins. Efficiency: As stated above, an air conditioner consumes a lot of power on start-up. Thus, frequent short cycles affect the efficiency of the air conditioner. On the other hand, efficiency of air conditioner improves as it runs for more amount of time per cycle i.e. longer cycles. 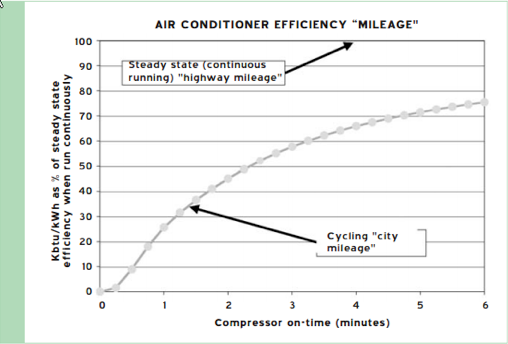 The efficiency “electricity mileage” (kbtu/kWh) improves when the air conditioner stays on longer. The total energy consumption drops because there are also longer pauses between cycles when the air conditioner does not run. Comfort: An conditioner running for a longer times gradually changes the temperature of the room, thus, giving a gradual increase in the comfort level. However, if the air conditioner designed to meet the set temperatures quickly, leads to sudden variations (decrease) in the temperatures, leading to less comfort level. Also, shorter cycles do not facilitate efficient humidity removal, thus leading to less comfort in the room. Thus, short cycle times are not recommended in case of air conditioners. What should be the ideal size of the air conditioner and ideal cycle time? There is no specific ideal cycle time for air conditioner as it completely depends on its cooling capacity and the room temperature and humidity. Typically, 10-20 minutes on cycle time should be good enough depending on the surrounding conditions. Usually, since an over-sized air conditioner has greater cooling capacity, it runs shorter cycle. Thus, over-sizing an air conditioner is not advisable. At the same time, an undersized air conditioner may not be able to give the required amount of cooling and comfort. Hence, it is necessary to select the optimum size of the air conditioner to ensure an optimum cycle time. To summarize, very short cycle time and over-sizing the air conditioner should be avoided. Proper sizing and optimum cycle time are the key features to determine the effectiveness of an air conditioner to perform its functions.